Purpose: In this tutorial you will learn how to set up and execute a series of calculations for strained structures. Additionally, it will be explained how to obtain the derivatives of the energy-vs-strain curves at zero strain and how these quantities are related to elastic constants. 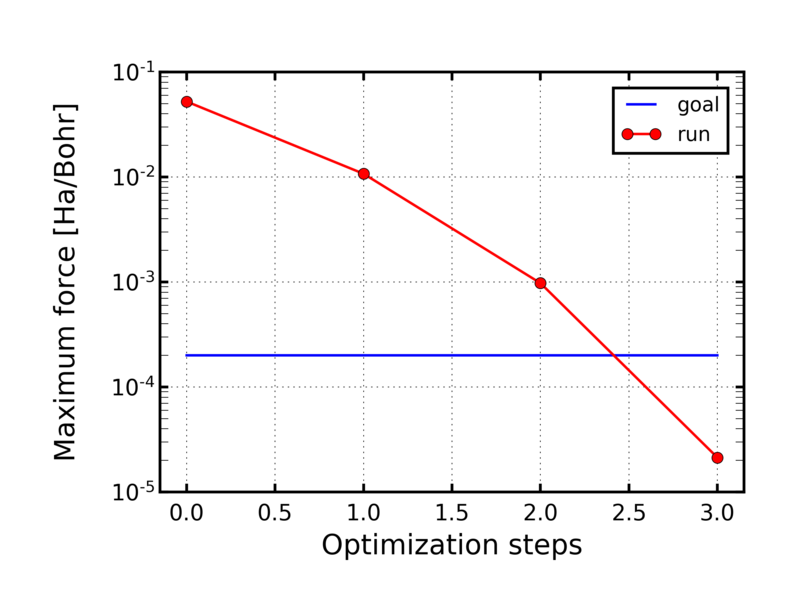 CHECKFIT-energy-vs-strain.py: Python script for extracting derivatives at zero strain of energy-vs-strain curves. 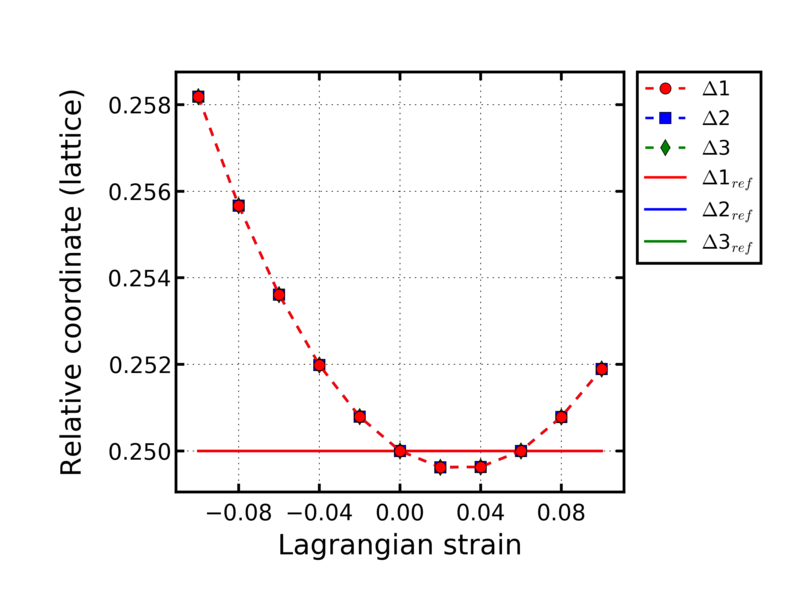 PLOT-energy.py: Python visualization tool for energy-vs-strain curves. 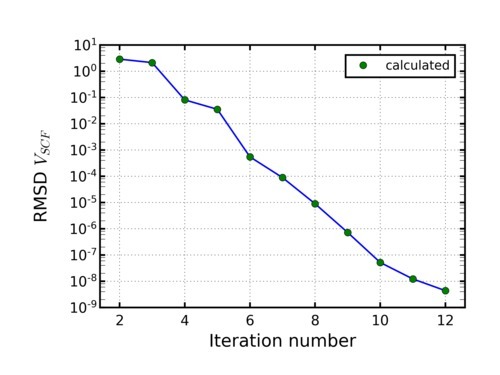 PLOT-status.py: Python visualization tool for RMS deviations of the SCF potential as a function of the iteration number during the SCF loop. PLOT-maxforce.py: Python visualization tool for the maximum amplitude of the force on the atoms during relaxation. PLOT-checkderiv.py: Python visualization tool for the calculation of derivatives at zero strain using the fit of energy-vs-strain curves. The first step is to create a directory for each system that you want to investigate. 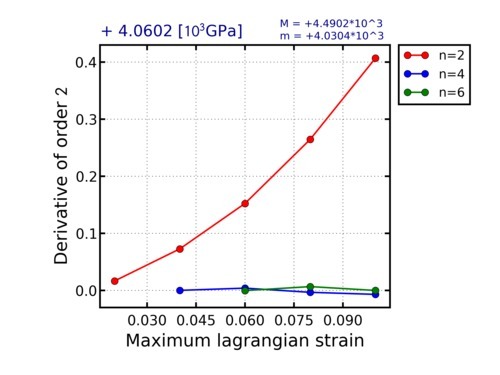 Here, we consider the calculation of the energy-vs-strain curves for carbon in the diamond structure. However, the procedure we show you is valid for any system. Thus, we will create a directory diamond-elastic-strain and we move inside it. Inside this directory, we create (or copy from a previous calculation) the file input.xml corresponding to a calculation for the equilibrium structure of diamond. This file could look like the following. Please, remember that the input file for an exciting calculation must always be called input.xml. Be sure to have in your file the appropriate command for performing the structure optimization: Deforming your system may change the relative positions of the atoms in the unit cell. 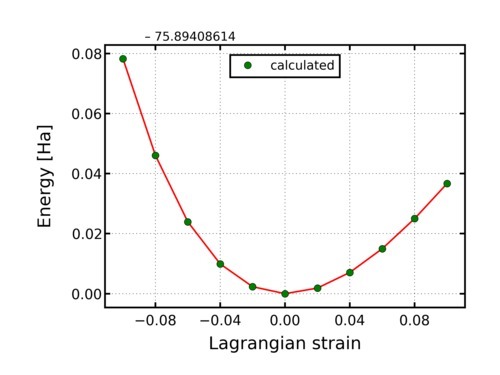 All strains considered in this tutorial are Lagrangian strains. In order to generate input files for a series of distorted structure, you have to run the script SETUP-elastic-strain.py. Notice that the script SETUP-elastic-strain.py always generates a working directory containing input files for different strains. Results of the current calculations will be also stored in the working directory. The directory name can be specified by adding the name in the command line. If no name is given, the script use the default name workdir. Very important: The working directory is overwritten each time you execute the script SETUP-elastic-strain.py. Therefore, choose different names for different calculations. The script SETUP-elastic-strain.py produces the following output on the screen (using deformation-0 as working directory). In this example, (on screen) input entries are preceded by the symbol ">>>>". Entry values must be typed on the screen when requested. The first entry (in our example 0.10) represents the absolute value of the maximum strain for which we want to perform the calculation. 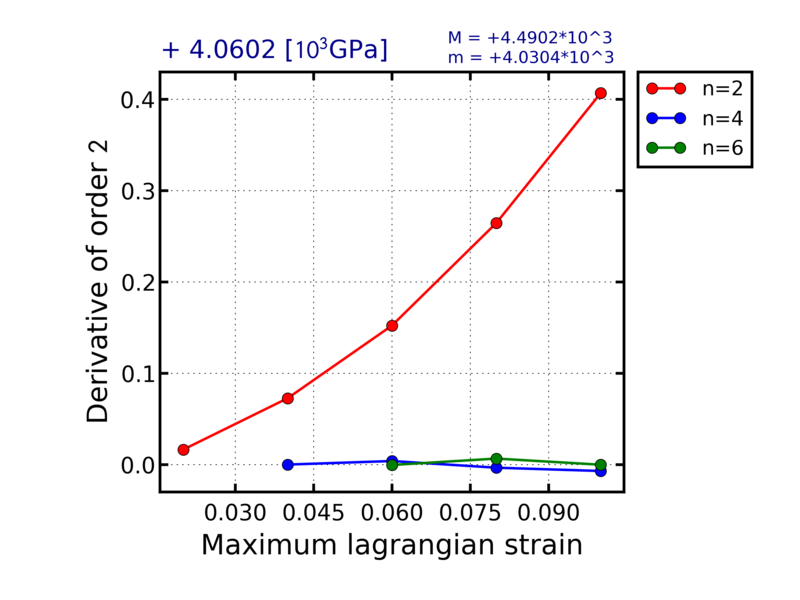 The second entry (11) is the number of deformed structures equally spaced in strain, which are generated between the maximum negative strain and the maximum positive one. The third (last) entry (0) is a self-explained label indicating the type of deformation. The latter is always referred to 2-dimensional strain tensors in the Voigt notation (so that, e.g., a strain value of 0.10 corresponds, for the choice 1 of the deformation code, to a linear deformation of 10% along the x direction). After running the script, a directory called deformation-0 is created, which contains input files for different strain values. To execute the series of calculation with input files created by SETUP-elastic-strain.py you have to run the script EXECUTE-elastic-strain.sh. If a name for the working directory has been specified, then you must give it here, too. After the complete run, move to the working directory deformation-0. At this point, inside the directory deformation-0, you can use the python script CHECKFIT-energy-vs-strain.py for extracting derivatives at zero strain of energy-vs-strain curves. In this example, input entries are preceded by the symbol ">>>>". 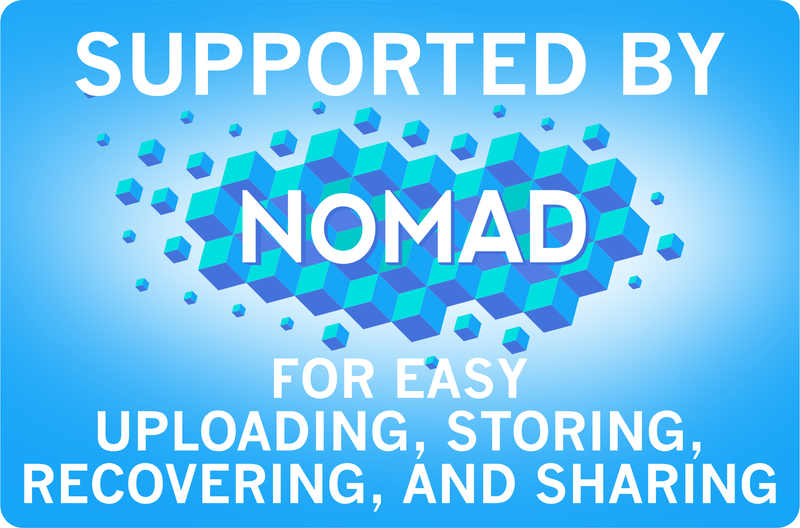 Entry values must be typed on the screen when requested. The first entry (in our example 0.10) represents the absolute value of the maximum strain for which we want to perform the calculation. The second entry (2) is the order of the derivative that we want to obtain. The script generates the output files check-energy-derivatives and order-of-derivative, which can be used in the post-processing analysis. Results of this script can be analyzed using the visualization tool PLOT-checkderiv.py. All the scripts mentioned here must be executed in the directory where the energy-vs-strain, check-energy-derivatives, and order-of-derivative files are located. The scripts produce as output a PostScript file named PLOT.ps as well as a png file (PLOT.png). 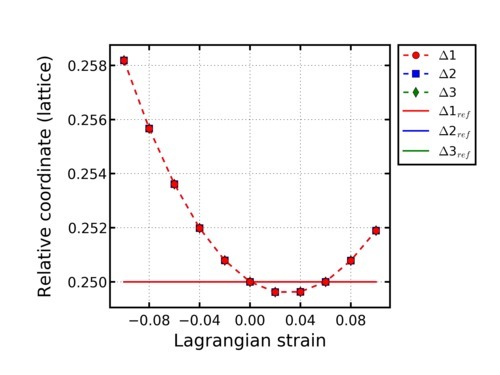 This script allows for the visualization of the energy-vs-strain curve. It is executed as follows. In the following, we display the result for the example mentioned above (carbon in the diamond structure, volume-strain deformations up to 10%). the maximum degree of the polynomial used in the fitting procedure ("n"). The script PLOT-checkderiv.py requires as input the check-energy-derivatives and order-of-derivative files generated by CHECKFIT-energy-vs-strain.py and is executed as follows. One or two optional entries can be specified on the calling line. Assigning numerical values to these two entries, you can set the minimum (YMIN) and the maximum (YMAX) value on the vertical axis, respectively. An example of the script output is the following. The previous plots can be used to determine the best range of deformations and order of polynomial fit for each distortion. By analyzing the plot, we note that curves corresponding to the higher order of the polynomial used in the fit show a horizontal plateau at about 4060 GPa. This can be assumed to be the converged value for the second derivative, from the point of view of the fit (further information on this topic can be found here). For this distortion type, this value equals 9 times the bulk modulus. Thus, the extracted value of the bulk modulus is about 451 GPa. 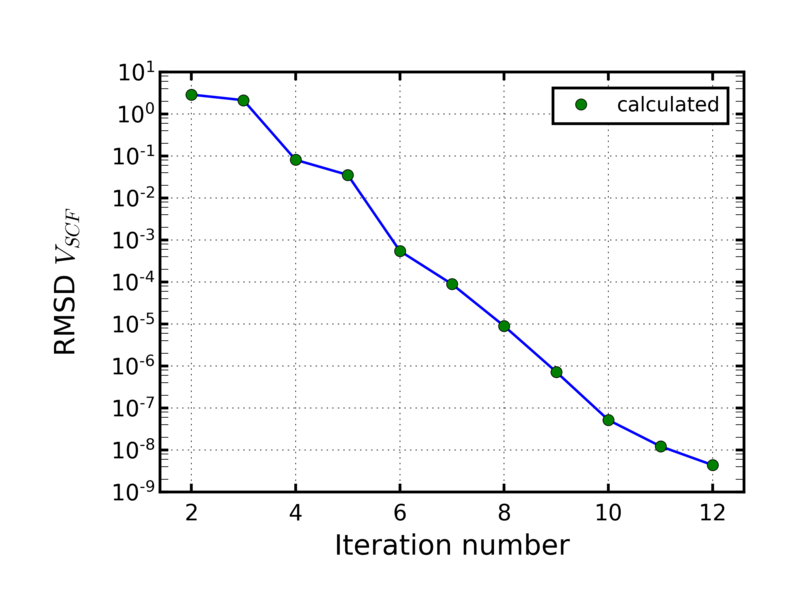 Python visualization tool for the RMS deviations of the effective SCF potential as a function of the iteration number during the SCF loop. It is executed as follows. Here, the entry on the command line, LABEL, must be specified and represents the name of the directory where an exciting calculation has been or is still running. The PLOT-status.py script is particularly useful in the latter case because one can follow "live" the convergence of the calculation. An example of the PostScript output of the script is the following. Different line segments correspond to SCF calculations for different geometries during the relaxation. Python visualization tool for the maximum amplitude of the force on atoms during relaxation. It is useful for deformations which allow for internal relaxation of atomic positions, e.g., for the deformation with the code 7. It is executed as follows. or maximum force target reached already at the initial configuration. Otherwise a plot will be produced as output. An example of the script output (for the deformation type 7) is the following. 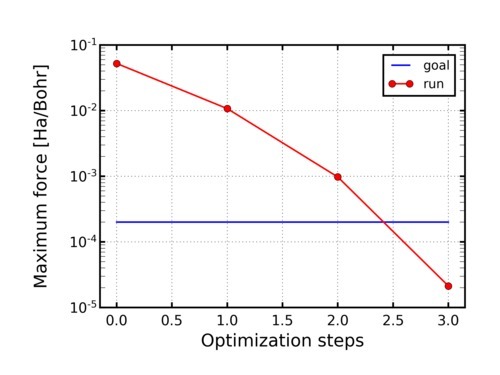 The red points show the calculated value at each optimization step, whereas the blue line indicates the target value of the maximum amplitude of the force for stopping the relaxation. 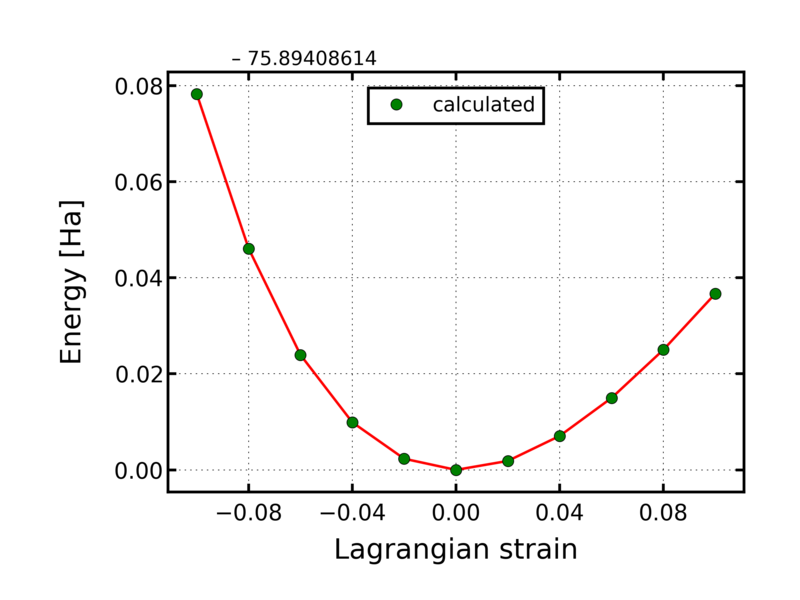 Python visualization tool for showing the optimized geometry compared to the reference (unrelaxed) geometry for the relative atomic coordinates of two atoms in the unit cell as a function of Lagrangian strain. It is useful for deformations which allow for internal relaxation of atomic positions, e.g., for the deformation with the code 7. It is executed as follows. Up to four optional entries can be specified on the calling line. The first two entries are numeric labels of the atoms referring to the listing of the atoms in the input file input.xml. For instance, setting ATOM1 = 2 and ATOM2 = 6 (for a cell containing at least 6 atoms!) means that one considers the second and the sixth atoms, as listed in input.xml (including atoms of all species). If ATOM1 and ATOM2 are not specified, their default values are 1 and 2, respectively. In case ATOM1 and ATOM2 are explicitly given, you can set the minimum (YMIN) and the maximum (YMAX) value on the vertical axis, respectively. An example of the PostScript output of the script for the deformation code 7 is the following. Here, (Δ1, Δ2, Δ3) and (Δ1ref, Δ2ref, Δ3ref) represent the position difference vector, $\bf r$ATOM2 - $\bf r$ATOM1, expressed in lattice coordinates, for the optimized geometry and the unrelaxed (reference) case, respectively. where B0 is the bulk modulus.